BPSC has declared result of Assistant Engineer Exam 2018. Candidates who appeared in the examination can check their result at the official website or direct link given in this article. 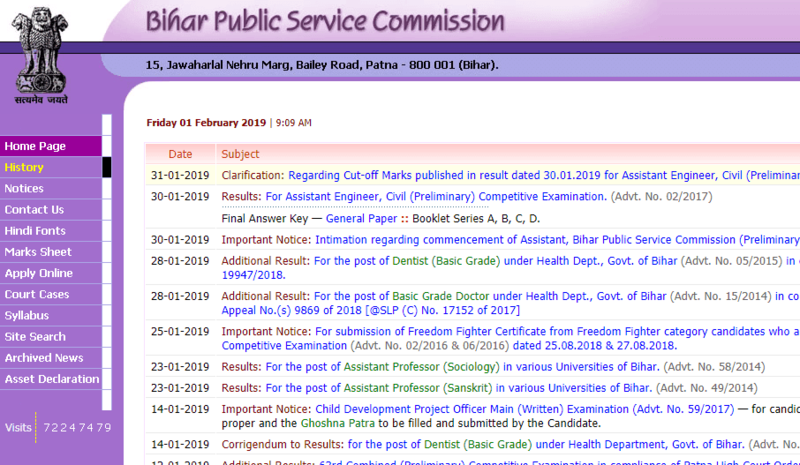 BPSC Assistant Engineer 2018 Result: Bihar Public Service Commission (BPSC) has released the results of Assistant Engineer Examination 2018. Candidates who appeared in the examination can check the result at official website of the commission http://www.bpsc.bih.nic.in/ and check their results. A direct link of the result is also given in this article too. BPSC AE Civil (Preliminary) Competitive Examination Result: You can click on this direct link to check the results. The Commission has also released the Final Answer for General Paper with the BPSC Assistant Engineer results. Bihar Public Service Commission conducted the Assistant Engineer (Preliminary) Competitive Examination on September 15, 2018. Candidates who qualify will be able to participate in the examination in the last week of March. According to the notification issued by the Commission, 11603 candidates have qualified in the BPSC AE examination. Nearly 17,800 candidates took part in the BPSC AE examination.